In the last few years, one of the most important issue among parents who have school-age children is their ability to read. A lot of school requires your little one to be able to read before being admitted to the school. Parents will then put their little one into reading course. Is it really ‘the sooner the better’ in terms of reading for your children? When is the right time to start training your little one to read? 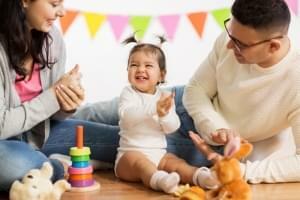 Generally, your little one can pronounce words that can be understood by others at the age of 2-3 years old. They can also create a sentence containing 2-3 words. At the age of 3 years old, your little one can make a question mark. Your little one can tell story by the age of 4 years old. Enrich your little one’s vocabulary by reading them some story book. Story telling can trigger your children’s reading instinct in the future. Spend more time to talk to your children. Trigger their brain by giving simple questions. At this phase, your children can be taught to read, which is pre-reading skills. Pre-reading skills is the time when your little one is about to enter kindergarten and get their first reading lesson at school. Your little one’s ability to read increase during this time. Generally, they can read difficult words like mango, lift, and oil. They can do this without pronouncing the words before. Your little one can also read simple storybook. Introduce your children to as many story books as possible. You can adjust the type of books according to your children’s interest. Bring your little one to explore library as the source of books. At this age, your little one can read by himself fluently. Increase your children’s vocabulary by giving them storybooks. At this phase, he already has reading preferences, like science and animal. What if your little one cannot read simple words when entering primary school? You do not need to worry. A study performed by Vellutino, Scanlon ad Lyon in 2000 showed that children with slow reading skills during kindergarten to second grade primary school has similar level of IQ as those children with better reading skill at that age. When training your little one’s reading skill, make sure to understand their condition. There are certain medical conditions that make it more difficult for your children to read like dyslexia, receptive language disorder, and attention deficit disorder. If you suspect your children’s to suffer from one of those conditions, consult to a psychologist or pediatrician so they can get the right treatment. When the Little One acts up, Daddy and Mommy often take action in the hope of disciplining him/her. But not infrequently, the Little One is given punishment. What is the difference in educating and disciplining the Little One? Although most cases of the Little One’s cough are "self-limited disease" or can heal on their own, but if the cough often happens at night, it can disturb sleep quality. How to deal with it?